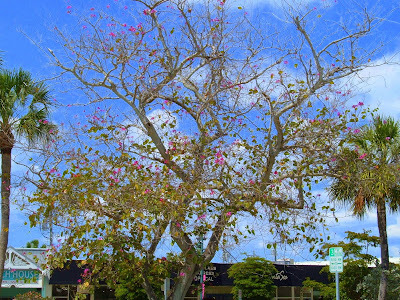 St. Armand's Circle, Sarasota, FL. I don't know about you, but oftentimes I get so busy with work and life in general, that I forget to take time to enjoy the place I live and appreciate what the community has to offer. This past weekend I took a day off and spent a little time pretending to be a tourist in my own town. The weather couldn't have been more perfect. 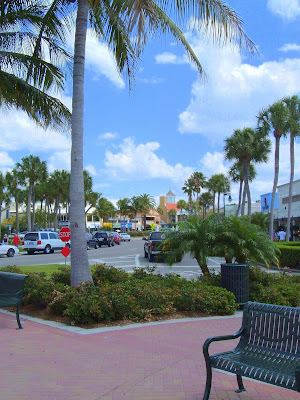 I thoroughly enjoyed having lunch with some great friends followed by a leisurely stroll around St. Armand's Circle, an outdoor shopping area with loads of little pastel hued boutiques, restaurants and galleries set around a picturesque central landscaped park on Lido Key. For a few hours, I felt like I was on vacation and got a much-needed recharging. After that, I spent a while at the bookstore, browsing to the accompaniment of some horribly out-of-tune Bluegrass performers. They could have made even a Tennessee granny want to pluck her chin whiskers out! Sad to say, I was strangely relieved when the lead performer started whistling the larger part of a couple of tunes. Well, needless to mention, I couldn't handle that for long. I seriously think bookstores should consider banning vocals. Anyone agree? A trip to the beach at sunset topped off my day and I went to bed thinking,"I need to do this more often!" Minus the bookstore bluegrass, of course! A view of The Met - an upscale clothing store, day spa and salon. 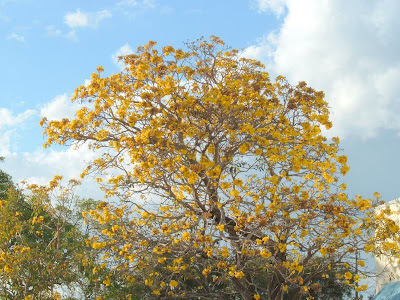 One of the gorgeous flowering Orchid trees indigenous to the area. 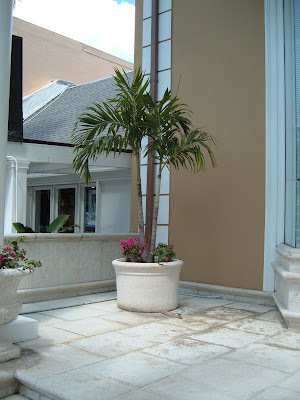 I love all the potted palms and beautiful flowering plants everywhere. 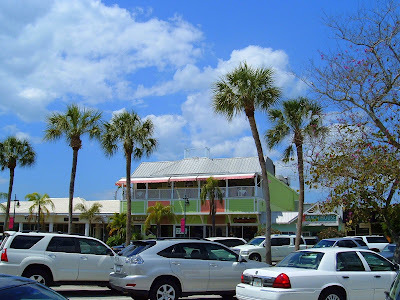 Hemingway's Hideaway - a popular local eatery in shades of tropical sherbet. 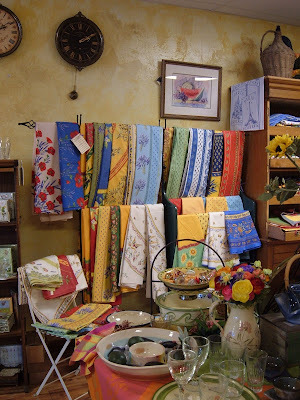 Some of the many colorful French linens at Decor de France, a charming local boutique. 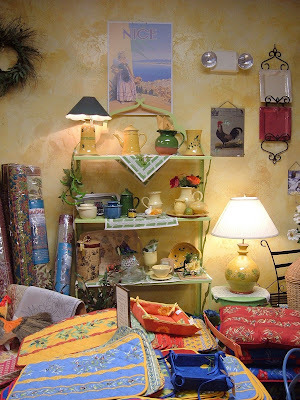 I love these quilted French table linens and the lime green iron baker's rack in the background. 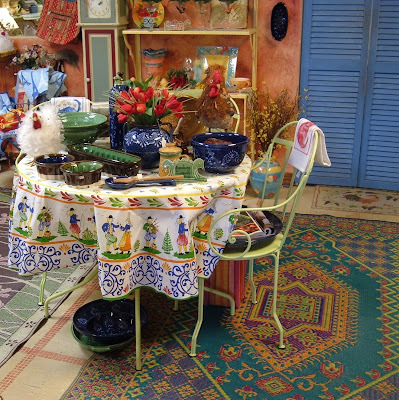 Decor de France sells these colorful indoor/outdoor rugs that are great for porches and lanais. 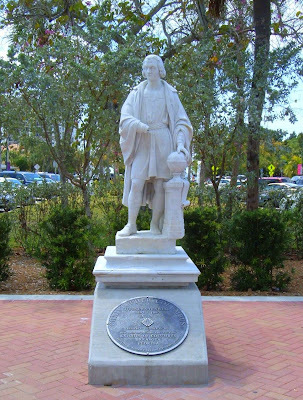 A statue of Christopher Columbus. 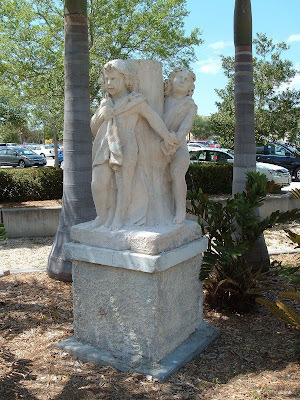 All of these beautiful statues ringing the circle that were once donated by circus magnate and former resident, John Ringling, have just recently been restored to their former glory. 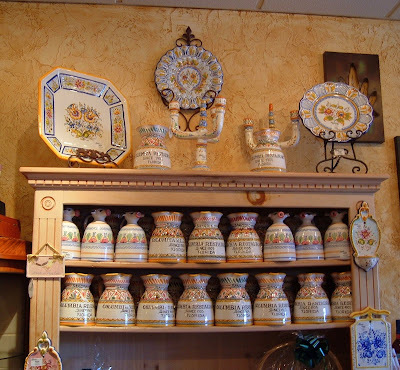 The Columbia Restaurant's adjoining gift shop that features many unique and colorful pottery pieces imported from Spain. 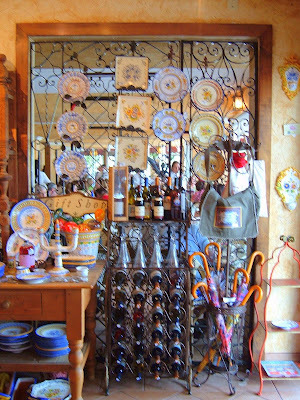 I think this traditional ironwork partition between the restaurant and shop is a perfect place to display some of the gorgeous Spanish ceramics. 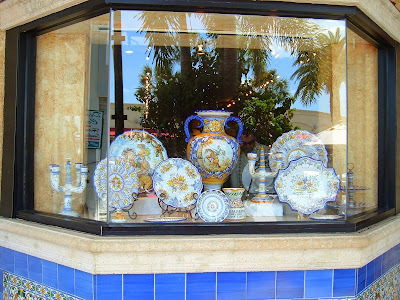 Is this colorfully tiled window full of eye candy or what? 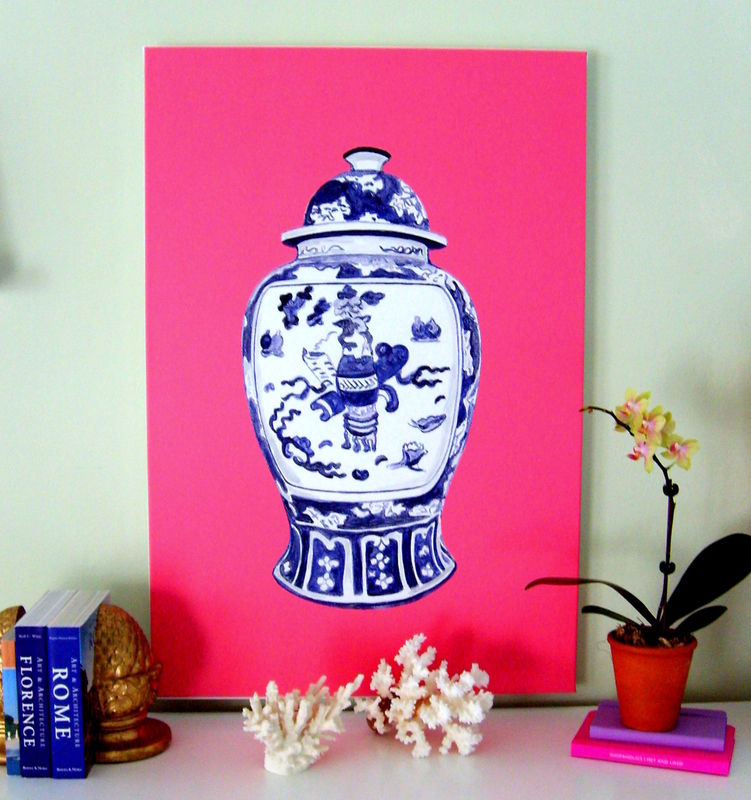 That urn is stunning - that color combination of the blue and yellow caught my eye. The prices on the ceramics are surprisingly reasonable. 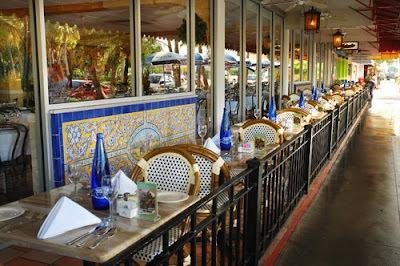 The Columbia restaurant has had an outpost in Sarasota since the late 1950's. 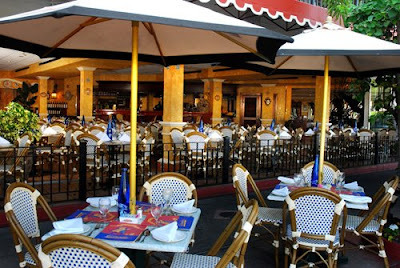 The food is amazing and it has a truly European atmosphere, especially with the outdoor bistro style tables. I am crazy about the chairs - just like those in Paris! I absolutely love the clever incorporation of traditional Spanish tiles everywhere! 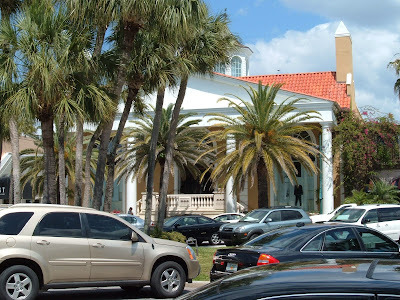 The Columbia Restaurant is a legendary Florida establishment. 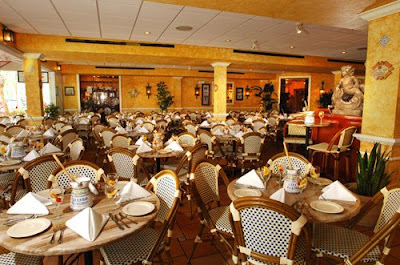 The first restaurant was opened by the Casimiro Hernandez family in Tampa in 1905. Since then, they have expanded to a family of 7 restaurants throughout the state. They are known for their authentic Spanish dishes and tapas. Another signature is their "1905 Salad" and the individual loaves of their paper-wrapped crusty warm bread. I could eat nothing but these two items and come away completely satisfied! It's truly a worthwhile place to visit with not only great food and ambiance, but outstanding and friendly service as well. This is the recipe for the "1905 Salad", their signature salad. Once you taste it, you will be craving it for days....(I am a big Worcestershire sauce and lemon juice fan, 2 of the key ingredients in the dressing) so I was thrilled to find the recipe on their website. Thank you, Columbia for generously sharing this with the public! Mix garlic, oregano, and Worcestershire sauce in a bowl. Beat until smooth with a wire whisk. Add olive oil, gradually beating to form an emulsion. Stir in vinegar and lemon juice and season with salt and pepper. Add Romano Cheese and toss one more time. Serves 4. 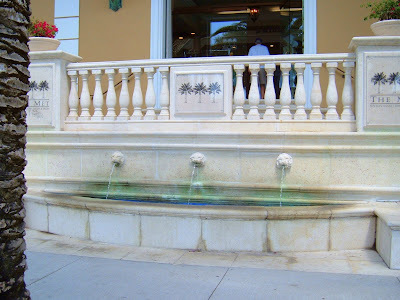 In "Banyan Trees", "Columbia Restaurant", "Decor de France", "Florida", "Recipes", "Sarasota", "Spanish Ceramics", "St. Armands Circle", "Statues"